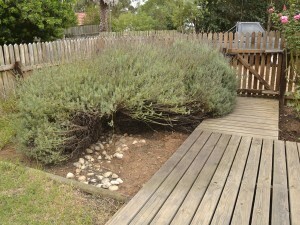 Hi Chris, I totally forgot to show you what I did with my overgrown lavender patch in the front garden. It has really grown too wild – so much so that we have to fight with the bushes just to get into the front gate. So my idea is to remove a few of them, retain some of the mature bushes and then work in some new plants to make it more interesting. I started this patch with a dried out river bed design, with the rocks meandering as if it was a dried out river, and to have the lavender surrounding it. Well, as you know, the lavender took over! So this is my first step. I took out the most invasive bush and you can already see the riverbed effect coming through. I will, however, have to re-set all the pebbles. After watching The Gardener DVD’s I now know how to lay a professional pebble patch!!! I’d love to see different grasses planted here – the lovely ornamental grasses would look beautiful. Hi Chris, I have been seriously thinking of your suggestion and I saw the pic of the grasses you sent via e-mail. So beautiful!!! I really think this is the way to go for the front patch. I’ll post my drawing which I did in my new Gardening Journal , so you can see my ideas. I also think it would look nice with some other flowers planted around the area. Sadly, the phrase “overgrown lavender patch” will never be used to describe my garden. Although I do have some lavenders that overwinter, it’s not entirely reliable here because of the cold wet winters. They certainly do not get huge like yours do. This is so true – I love looking at gardens and the inspiration and motivation comes from just that. I am fortunate that the sun shines most of the year here! Your path is really pretty. A dry stone riverbed will look good here, but if you cut back the lavender or divide it you will refresh it. Smaller plants will grow. If it is too woody, they do need replacement. I have a really good image of a stone path in a bed similar to what you designed here that I did for a client. Maybe I will post it if I can locate it. It is surrounded with lavender. I know you are adding other flowers, too. This beds had some also. Thanks for this Donna – I have to continuously tell myself that the lavender will one day need to be relaced. I will so interested at what you have done for a client! PLEASE let me know if you can! Much apprecaited.